Weekend getaways are rejuvenating, which is why I regularly plan small trips abroad. You don’t have to go very far to experience a different place and time. 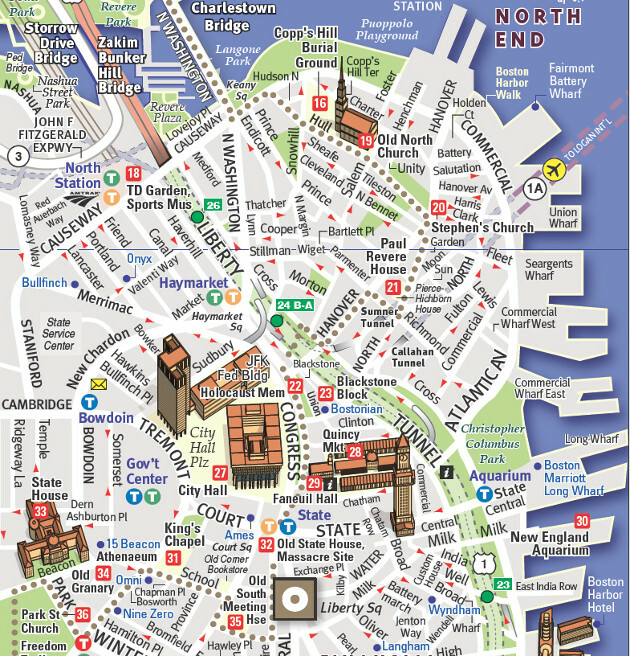 I live in Quebec, so Boston is an ideal weekend getaway destination. One Friday morning at dawn, a friend and I grabbed our bags and took off to discover Boston—a city that’s always intrigued me. Boston is only five hours away from my hometown, Montreal, just on the other side of the American border. It’s a charming historical city on the edge of the sea. The drive to Massachusetts offers particularly lovely panoramas. 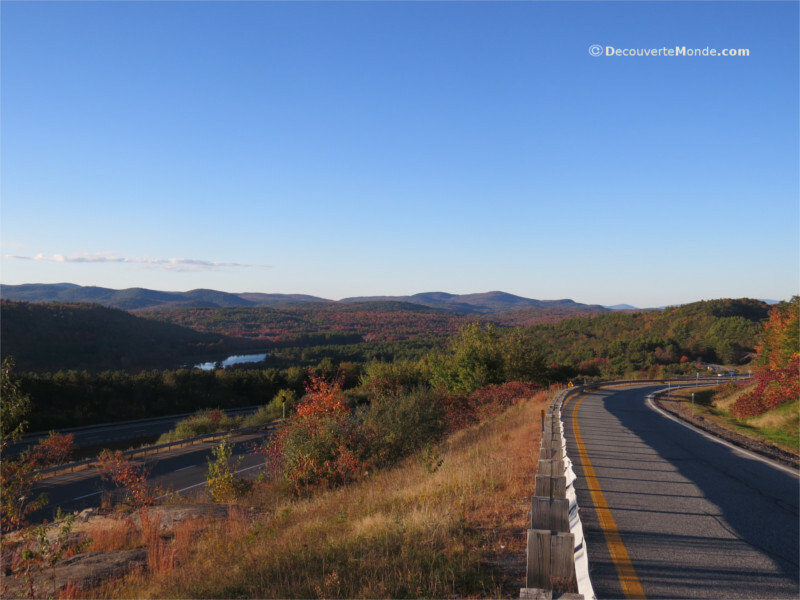 Crossing the White Mountains in the fall, the blaze of colours that greet you is pure visual pleasure. Take a tip from me: plan your trip to Boston in autumn; the air is fresh, the temperature comfortable, the landscape breathtaking, and less tourists. It’s the ideal time to go. 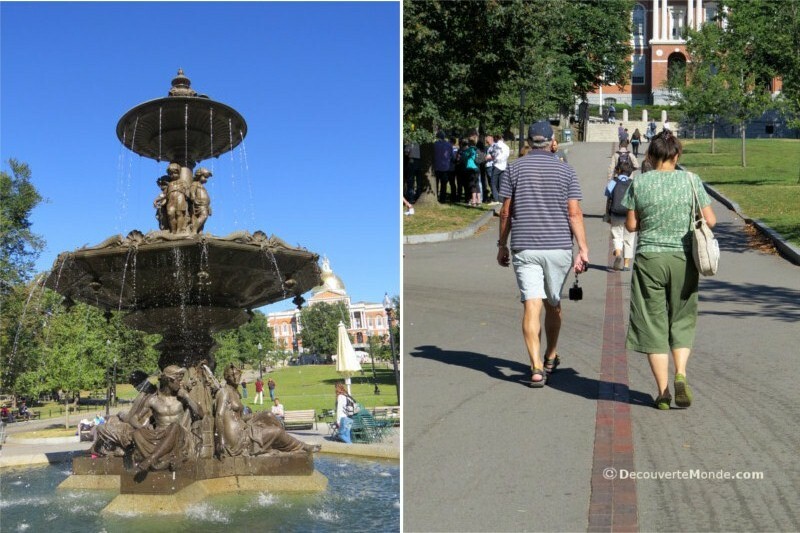 It’s possible to see Boston’s main attractions in three days. Our itinerary included Harvard’s internationally renowned campus and the student quarter in Cambridge. Next, a walk along the port was a must on our list, followed by dinner in Chinatown. In the evening, Beacon Hill’s luxurious residential neighbourhood makes for a delightful walk, lined with hundreds of old street lamps. We spent an entire day strolling along the Freedom Trail, retraceing an important part of American Independence. To be honest, I knew absolutely nothing about American history until I followed the red brick-lined route leading to historically significant sites. As they say, to travel is to discover a culture, , including the history of its people. 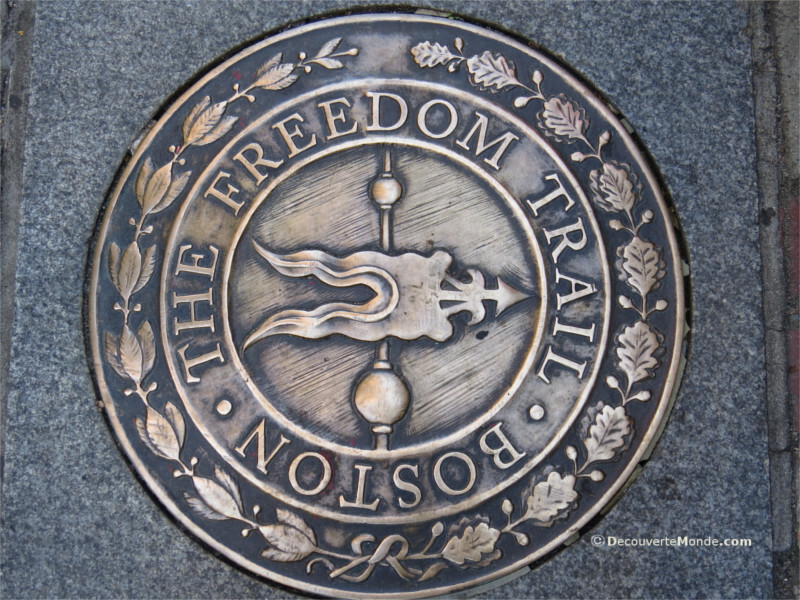 The Freedom Trail is a 4km walk that wanders through the heart of Boston and leads to 16 historically significant sites. All you have to do is follow the red-bricked road. Here are the sites that left the biggest mark on me. We strolled through American history and discovered the story of its proud nation at our feet. Boston was the stage for the fight for freedom in many respects; during the American Revolution in the 18th century, the colony struggled for release from the British yoke. The major events of this era were the Boston Massacre, the Boston Tea Party, and Paul Revere’s Midnight Ride. In the 19th century, came the Civil War that put an end to slavery of African Americans. The trail starts at the tourist information centre in the Boston Common, the oldest of Boston’s parks and a giant public space that houses many historical buildings. This park was the training field for the English army and the site of many hangings of rebels. Today, it’s a rather lovely park and it’s here that you can get a map and a description of the sites along the trail. Simply find the starting point on the red line and begin your trip through the past. 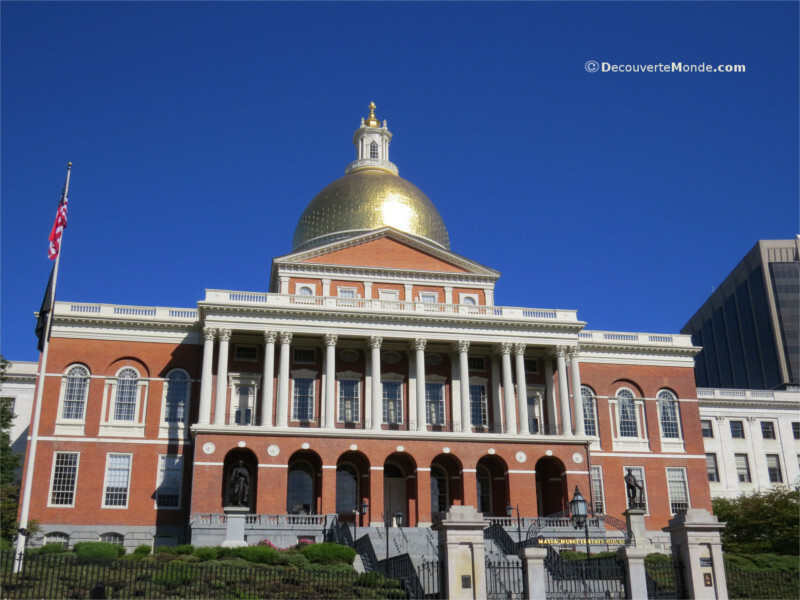 The first building you’ll see is the Massachusetts State House, Boston’s golden domed architectural symbol. It’s the state capitol and house of government of the Commonwealth of Massachusetts. Opposite this imposing building, you’ll find a bronze monument representing the Civil War era All-Black Regiment of Robert Gould Shaw. This is the starting point of the Black Heritage Trail, in recognition of the war from 1861-1865 that abolished slavery in the US. 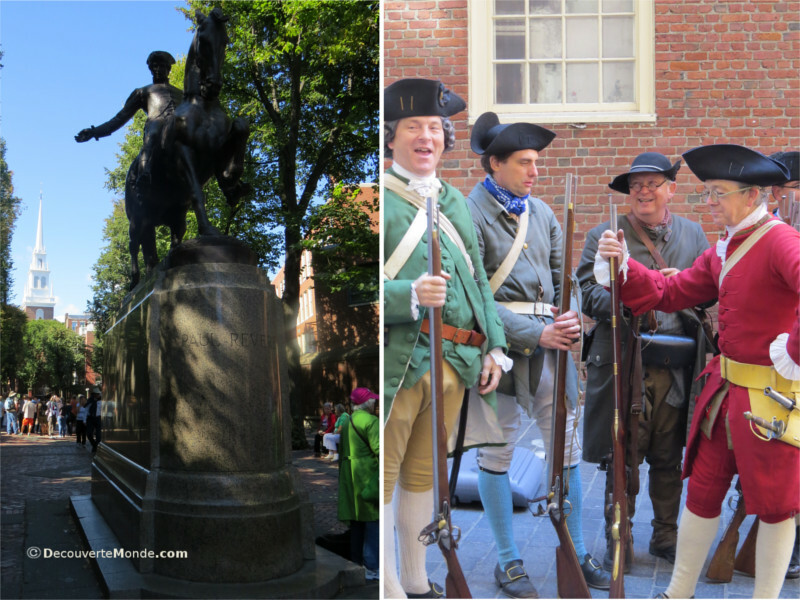 The trail continues and plunges directly into the heart of the American Revolution. 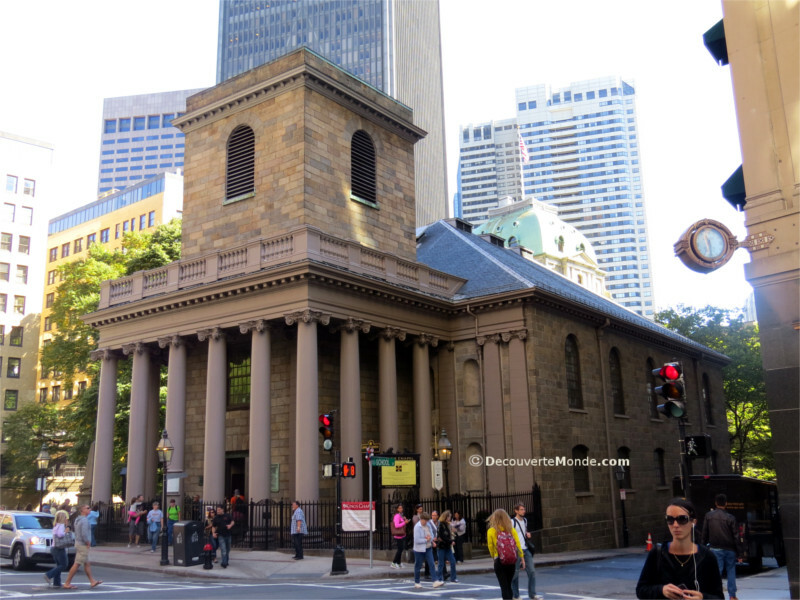 You’ll find churches that played a major role in the fight for freedom, like the King’s Chapel, an English church at the time and a symbol of English tyranny; you’ll also find Old South Meeting House, where more than 5,000 Bostonians gathered to plan the Boston Tea Party. During this political protest of the high taxes on goods in the colonies, the “Sons of Freedom” boarded English ships and threw barrels of tea overboard. You’ll also pass by the famous Old North Church that gave the signal to Paul Revere, hero of the American Revolution, that the English fleet had arrived. It was during his legendary Midnight Ride that he rode to Lexington to warn John Hancock and Samuel Adams of the British arrival. His house, which is also the oldest in Boston, is close by. There’s also the Park Street Church where the patriotic hymn “American” was sung for the first time. 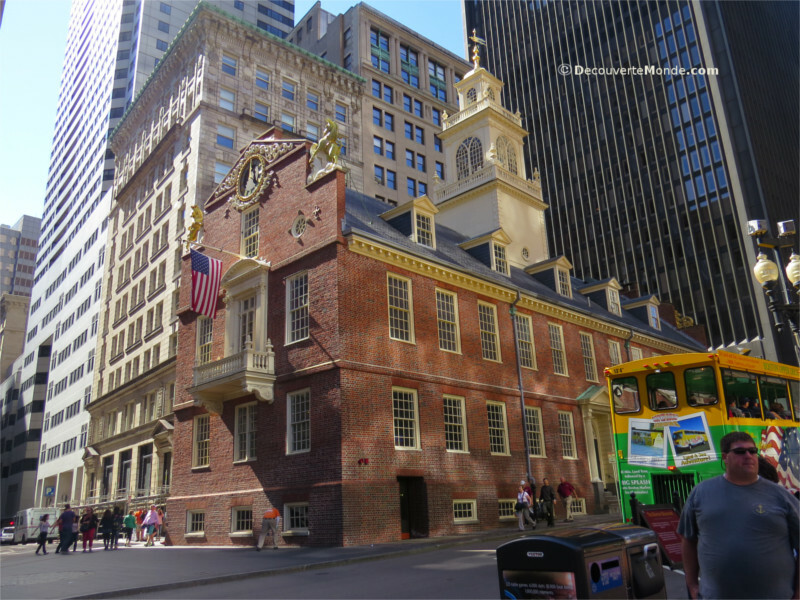 I enjoyed photographing the oldest building in Boston, Old State House, , which stands in contrast to the enormous contemporary buildings around it. It was the seat of British authority, which explains why numerous protests happened at this site. The Boston Massacre also happened here, during a protest of the colonists against the British regime. This symbol of British tyranny is also the site where, from his balcony, John Hancock, first governor of Massachusetts after the Revolution, waved to the crowd. 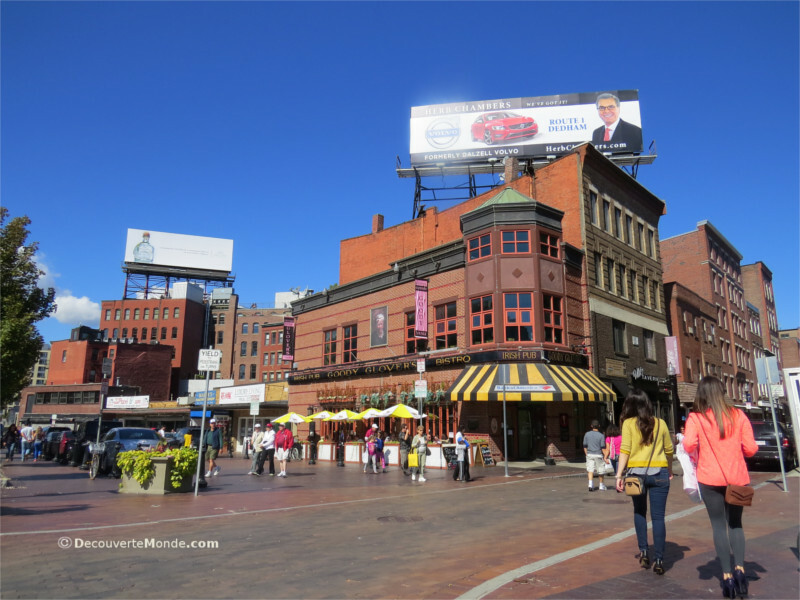 You’ll then see Faneuil Hall, also nicknamed the “Cradle of Liberty” for having housed the first mass assemblies and the adjacent Quincy Market. These architecturally magnificent markets are the ideal location for a lunch break. Food kiosks abound, and although I didn’t have a chance to try them, the lobster sandwiches seemed to be popular. Don’t miss the old cemeteries that line the trail too. 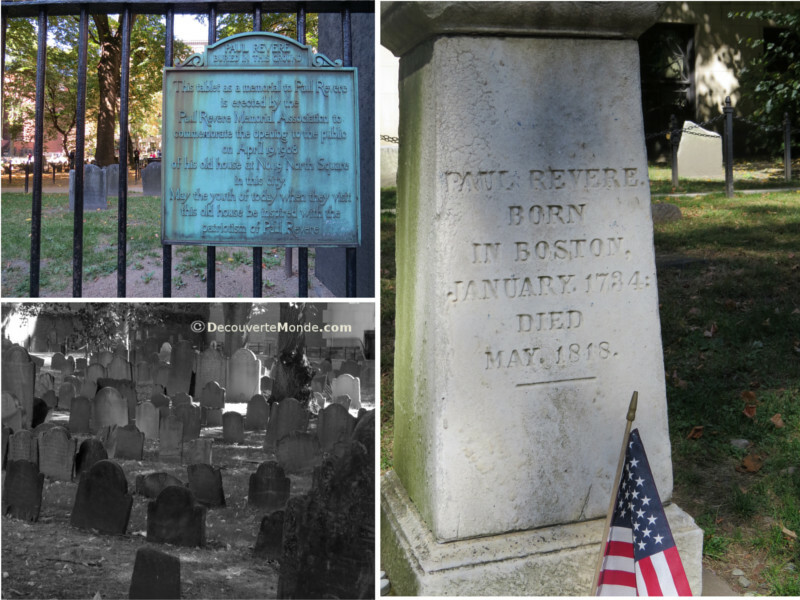 The most famous of which, Granary Burying Ground, is where Adams, Hancock, Revere, the father of Benjamin Franklin, and the victims of the Boston Massacre are buried. The ambiance of the place is peculiar: thousands of small, gloomy tombstones in disarray, sprinkle the grounds in the midst of towering buildings. The trail ends at the Bunker Hill obelisk, one of the bloodiest battles between the British and the Americans during the American Revolutionary War. 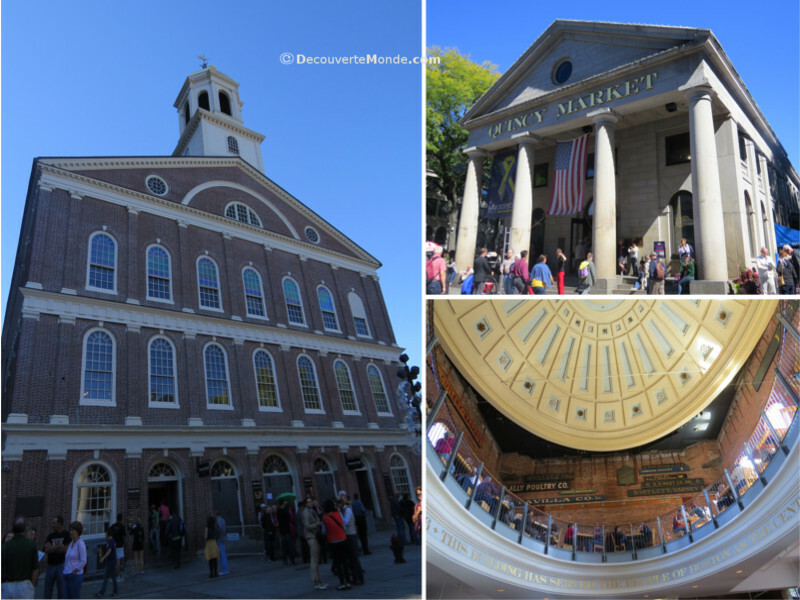 The Freedom trail has many other historical buildings of interest, but I’ll let you discover them yourself, as you wander through this spectacular city. If you’re not from the province of Quebec, this charming city is still worth a visit. Boston is well situated at the ocean’s edge, and is close to Cape Cod, one of the most beautiful sites along the American Atlantic Coast. If you’re in the area, be sure to visit Salem; a site that’s sure to plunge you into the fantastical (or real) world of witchcraft. Even if it’s just for a short, weekend getaway, make sure you travel to the US with travel insurance, like one of the policies from TuGo. It’s important to be covered, especially as US medical costs can leave more than an unpleasant aftertaste! Another helpful tip: If you’re a history buff, hire a guide at the starting point of the trail. Disguised in period costumes, they’ll take you straight to the heart of the city’s history. Article super interessant, et Boston a l’air d’être une très jolie ville remplie d’histoire. Merci pour votre commentaire, Cédric! J’espère qu’on vous a inspiré à voir Boston un jour! Oui en effet c’est vraiment une ville super charmante. Je l’ai même préféré à New-York. Ce qui est bien de Boston aussi c’est la proximité avec d’autres sites d’intérêt. Pour les gens qui aiment la montagne et le plein air il y a les Whites Mountains à environ 2 heures de là. Sinon, Salem est assez particulière avec l’histoire de ses sorcières. Je suis allée a Cape Cod tout près de Boston il y a 3 semaines et franchement c’est un endroit magnifique pour des vacances. Le contact avec la mer, l’ambiance reposante dans un décor enchanteur. C’est aussi un incontournable pour un voyage en Nouvelle-Angleterre. Tu as l’intention de visiter cette région sous peu?